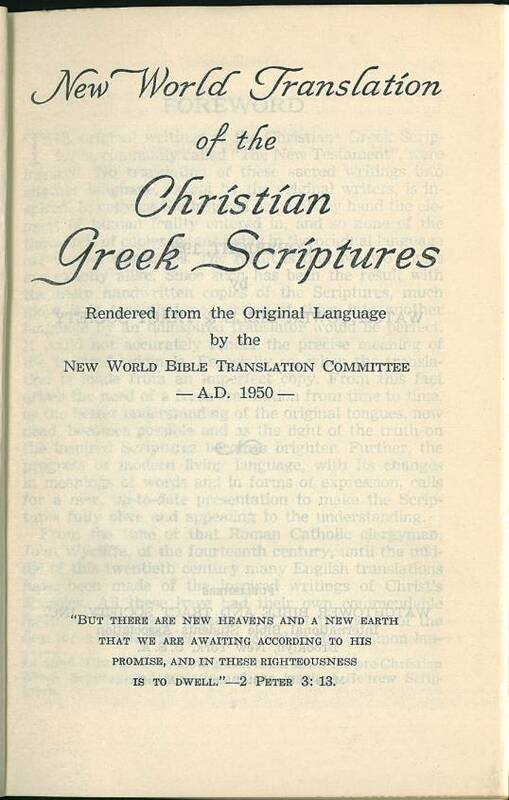 The New World Translation of the Christian Greek Scriptures was released on August 2, 1950 at the international assembly of Jehovah’s Witnesses in Yankee Stadium, New York, The first edition was 480,000 copies. 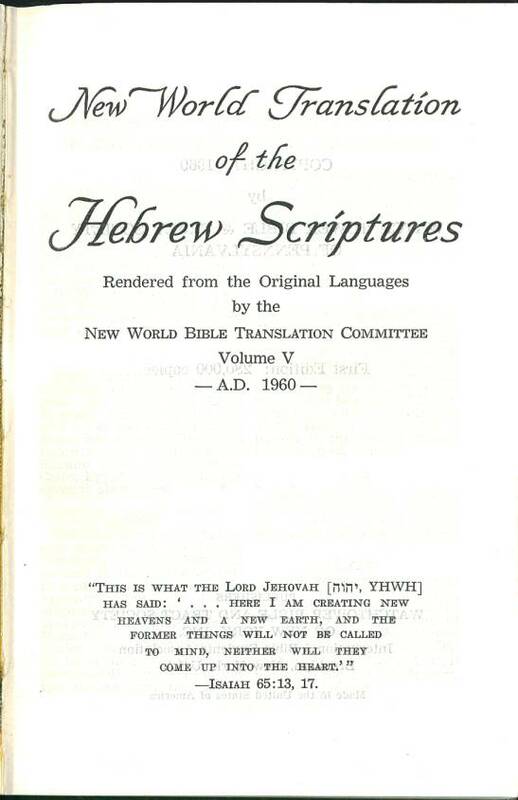 Nine months later, in May 1951, the first revision was published. 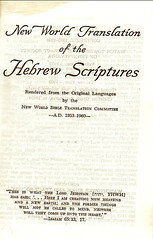 This second version was incorporated in the so called "Student's Edition"; see later. 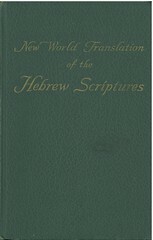 Volume I of the New World Translation of the Hebrew Scriptures was printed in 1953 and was released at the second international assembly of Jehovah’s Witnesses in Yankee Stadium. 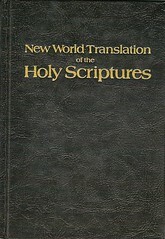 It contains the first eight books of the Bible. 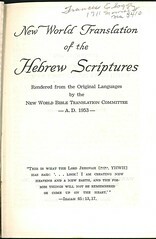 The first edition was of a half million copies. 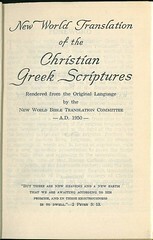 Volume II was released in 1955 in Chicago, Illinois, at the first of a series of thirteen five-day assemblies. 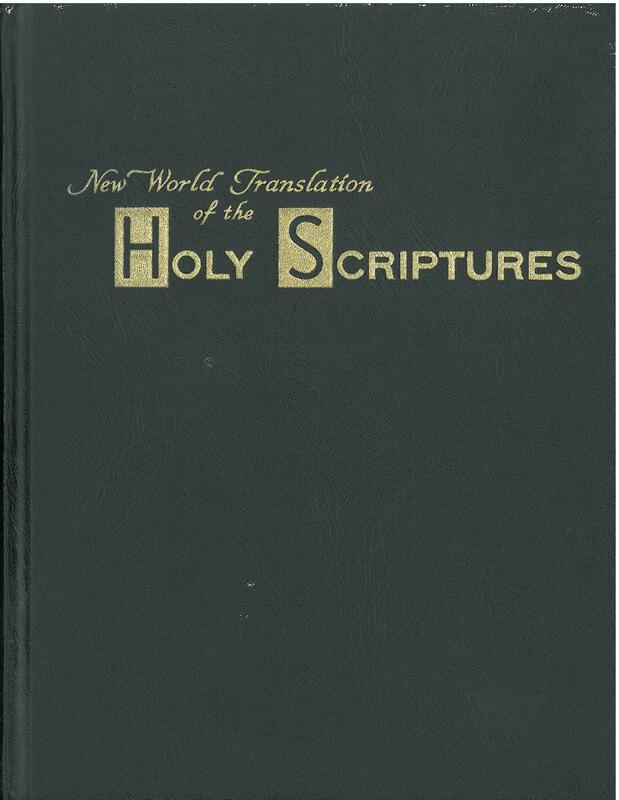 This volume, with a first edition of 300,000 copies, contains the next nine books of the Bible. 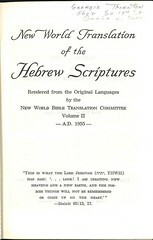 Volume III was released in 1957 as the feature of a series of District Assemblies of Jehovah’s Witnesses that summer. 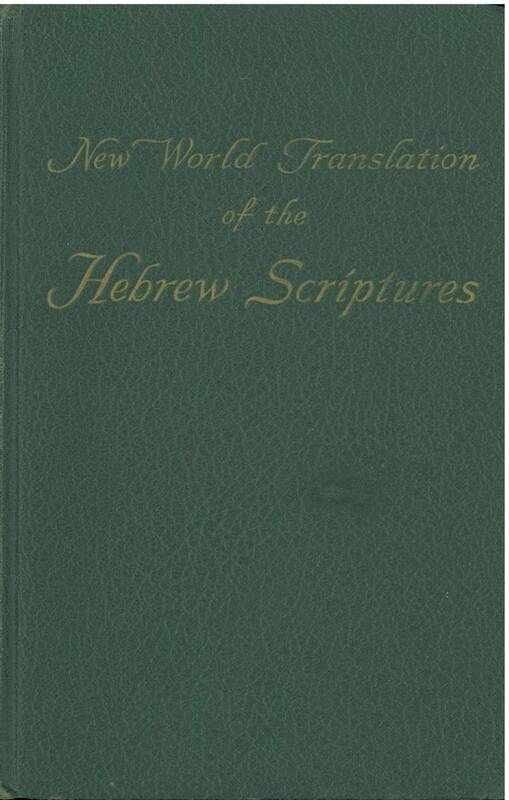 This volume contains the five poetical books of the Bible, and had a first edition of 350,000 copies. 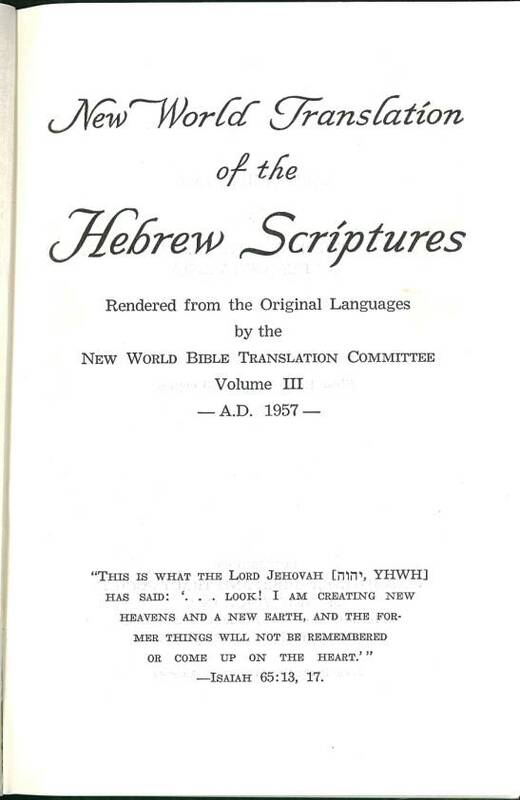 Volume IV was released in 1958 at the international assembly of Jehovah’s Witnesses in Yankee Stadium. 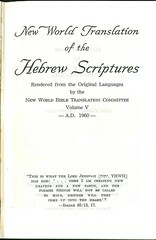 It contains the three prophetic books of Isaiah, Jeremiah and Lamentations, and had a first printing of 300,000. 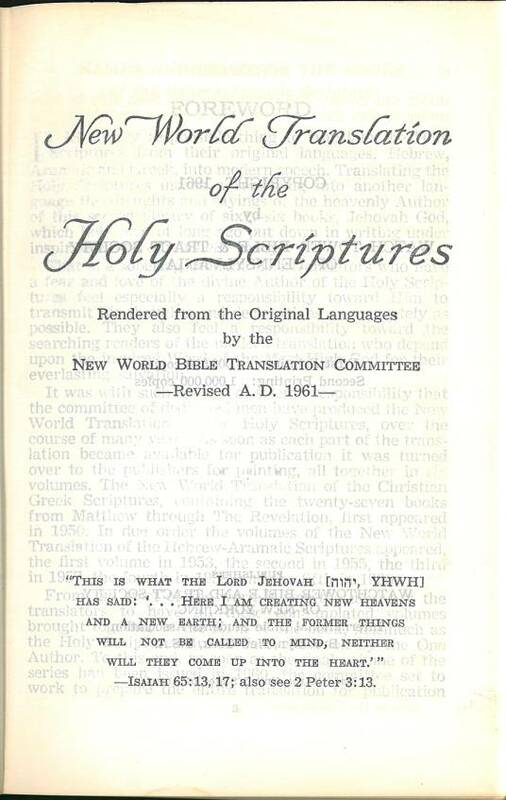 Volume V was released in 1960 at a district assembly of Jehovah’s Witnesses in Manchester England. 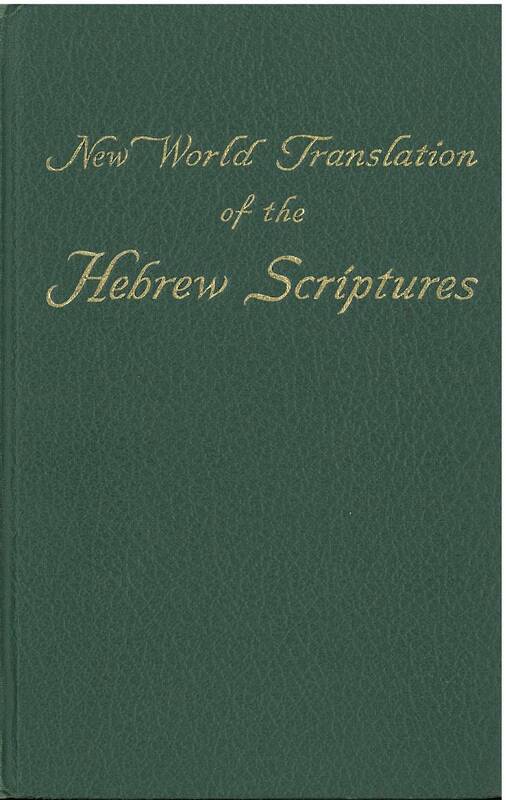 It contains the fourteen prophetic books from Ezekiel through Malachi, and had a first printing of 280,000. 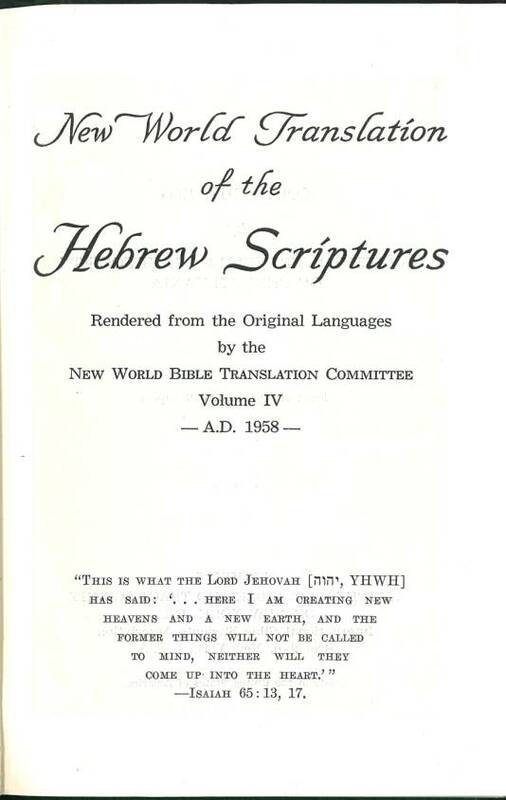 The Hebrew Scriptures Volumes I to V and the May 1951 revision of the Greek Scriptures were bound together in one; later this bulky volume was called ´Student's Edition`, but colloquially dubbed "Fat Boy" due to its girth of nearly 3500 pages. 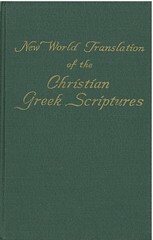 The first revised complete edition was edited in 1961, but devoid of cross references and footnotes. 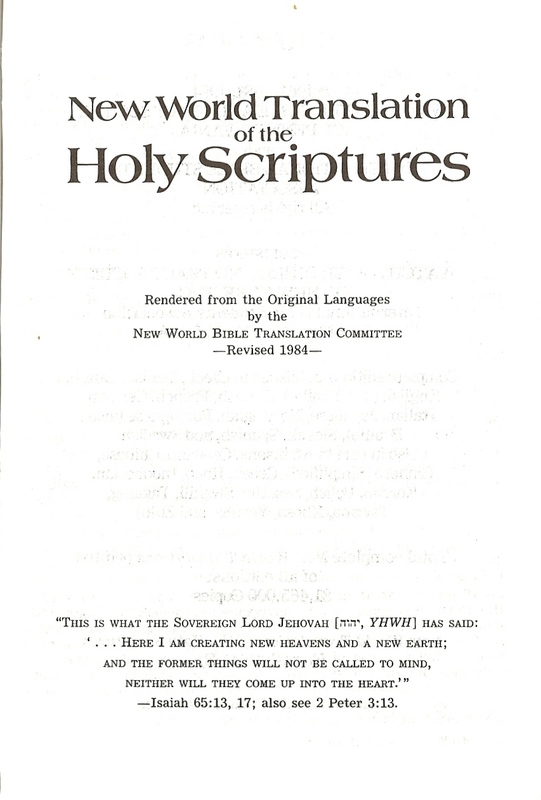 In identical shape this version was brought out with minor changes as "Second Revision" in 1970. 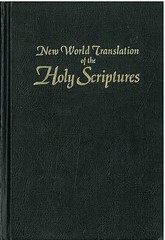 In 1984 a refinement of the translated text was published, together with an updating and expanding of the marginal cross references. 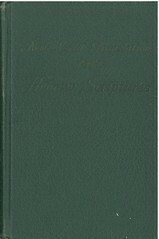 This edition has the editorial note –Revised 1984–; it was also available in larger size with "Study Helps". August 2013 saw the latest revision –Revised 2013 –, No. 5, called "Silver Sword". 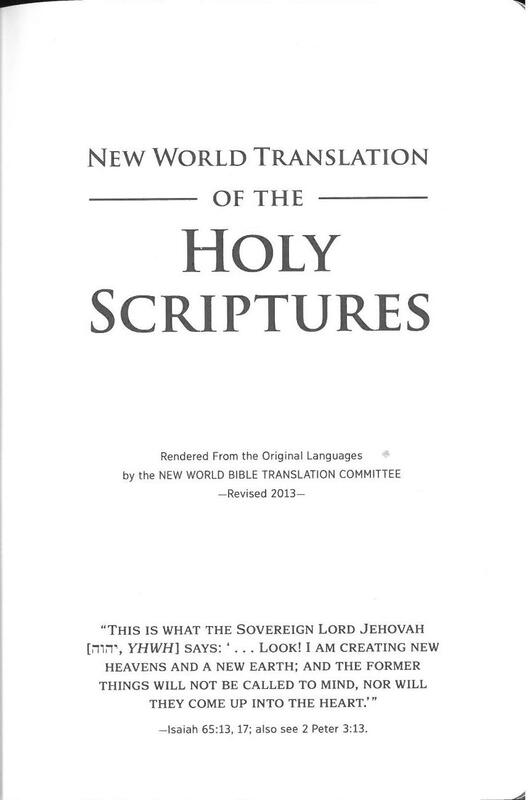 Since October 2013, at least one slightly corrected version was published. The amount of cross references has been reduced considerably. 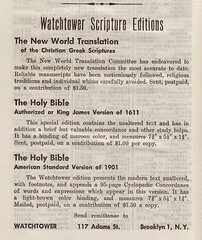 Advertisement for Watchtower Scripture Editions as shown in the first 1950 Greek Scriptures ed. 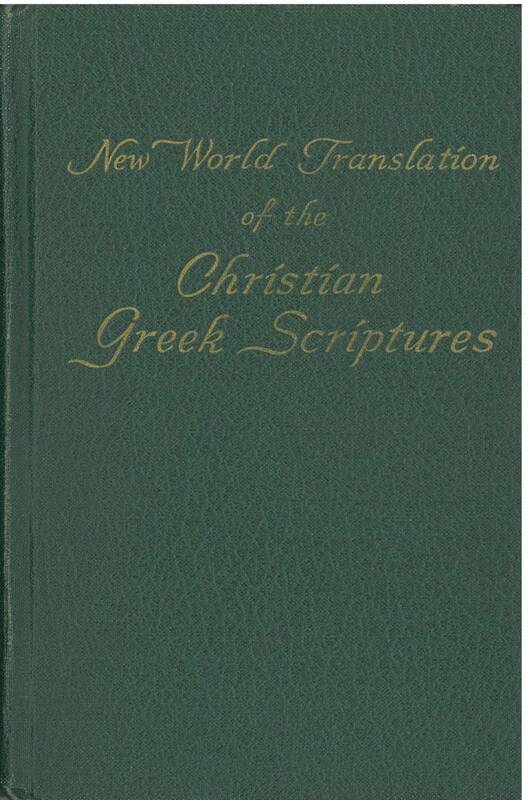 Contents: Christian Greek Scriptures (New Testament). 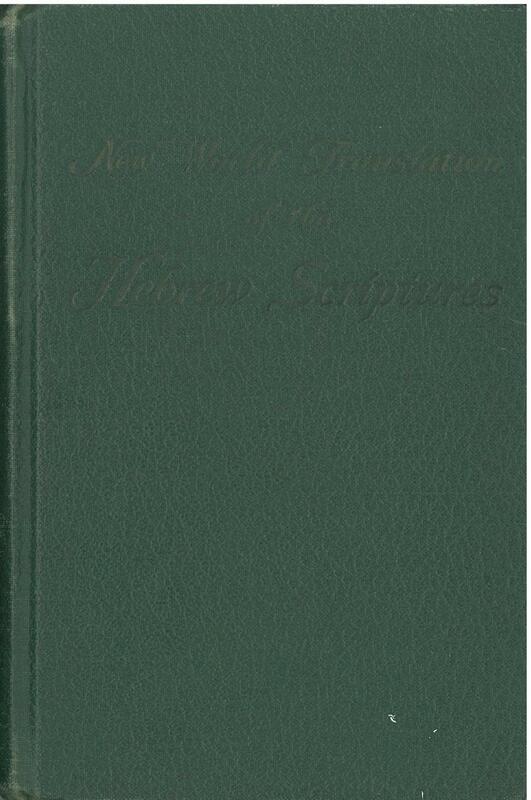 – Foreword (w/ photographs), Explanation of the symbols; Names and order of the books, Alphabetical index. 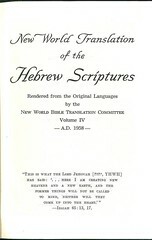 Apendix: Scripture verses specifically commented on; Subjects, Chain of outstanding Bible subjects and proper Bible names. 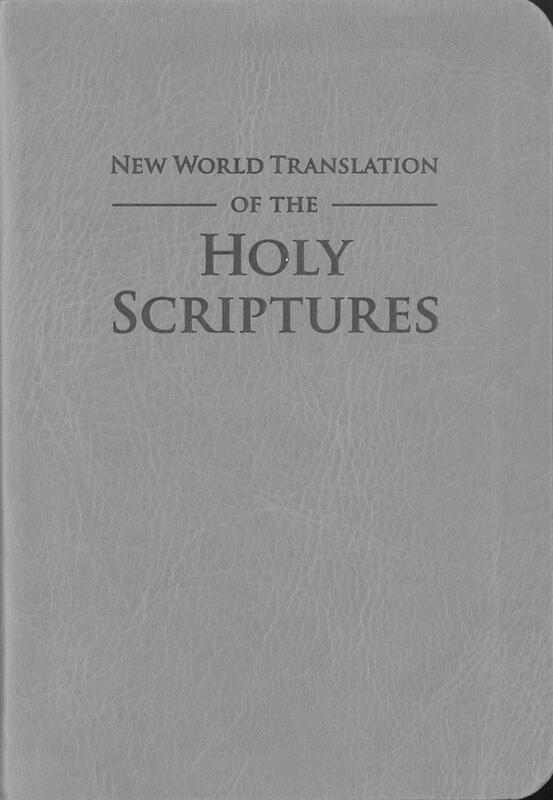 Watchtower Scripture Editions and Bible study aids; maps & drawings. References: Chamberlin 41-2, Herbert 2299, Hills 2494, Taliaferro CN00025, Taliaferro-EELBV 7990.100. Comments: Hardcover small octavo, sewn binding, 792 & (8) pp. 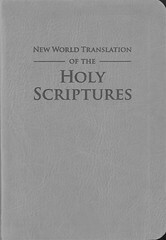 Scripture text in single column, cross references in the inner margins; alternate readings and manuscript information in footnotes. All the ancient manuscripts and Codices are listed in the “Explanation of Symbols …“ (6 pp). 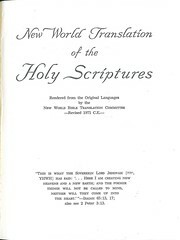 – The Appendix (35 pp) mainly deals with the typical JWs´ discussion topics, like the divine name ´Jehovah` and its occurences in the New Testament, the teaching about the torture stake vs. the cross, the tormenting of the deceased in the Gehenna, the mortality and destructability of the creature soul, the divinity of Jesus etc. References: Chamberlin 41-2, Herbert 2299, Hills 2494, Taliaferro CN00025, Taliaferro-EELBV 7990.105. 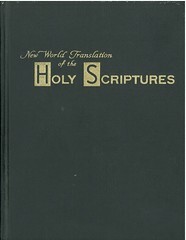 Comments: First edition: 480,000 copies, Second edition (revised May 1, 1951): 750,000 copies. 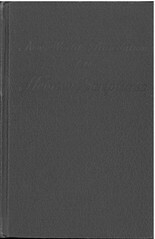 Facsimile: A facsimile is available at archive.org. References: Chamberlin 41-2, Hills 2527, Taliaferro CN00025, Taliaferro-EELBV 7990.112. 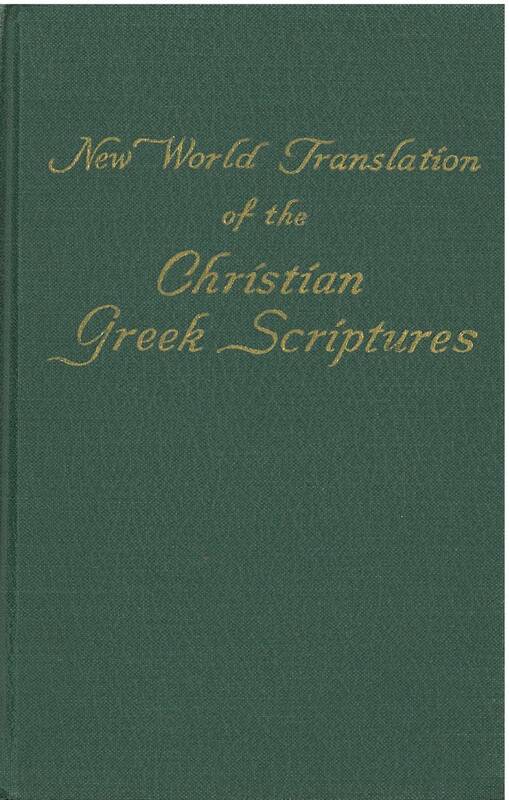 Comments: First edition: 500,000 copies. References: Chamberlin 41-2, Hills 2527, Taliaferro CN00025, Taliaferro-EELBV 7990.113. 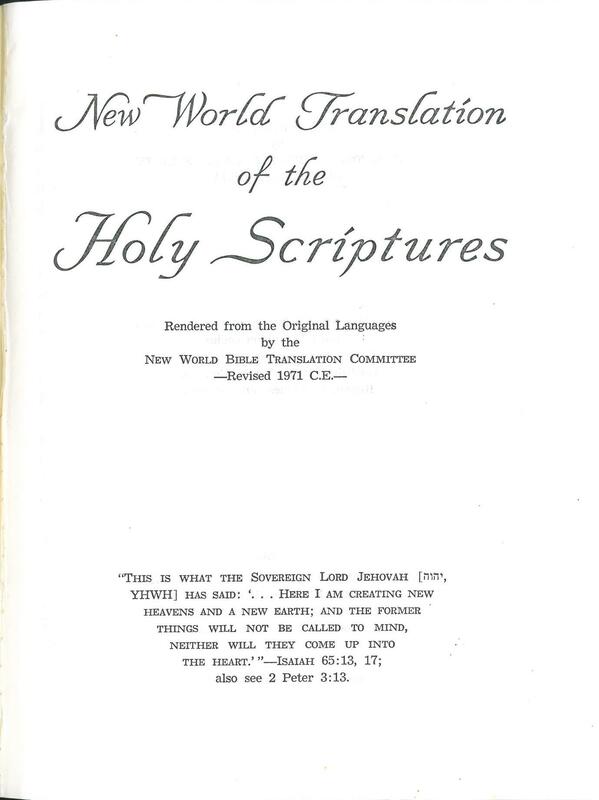 Comments: First edition: 300,000 copies. References: Chamberlin 41-2, Hills 2527, Taliaferro CN00025, Taliaferro-EELBV 7990.114. 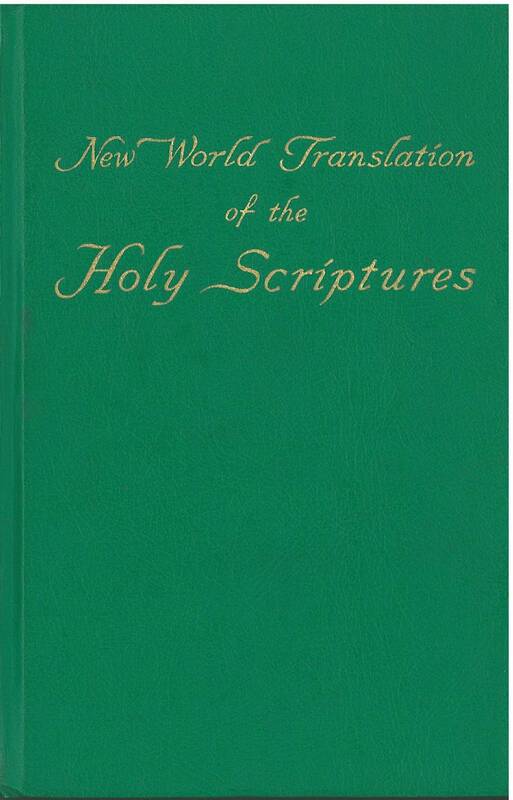 Comments: First edition: 350,000 copies. References: Chamberlin 41-2, Hills 2527, Taliaferro CN00025, Taliaferro-EELBV 7990.115. References: Chamberlin 41-2, Hills 2527, Taliaferro CN00025, Taliaferro-EELBV 7990.116. 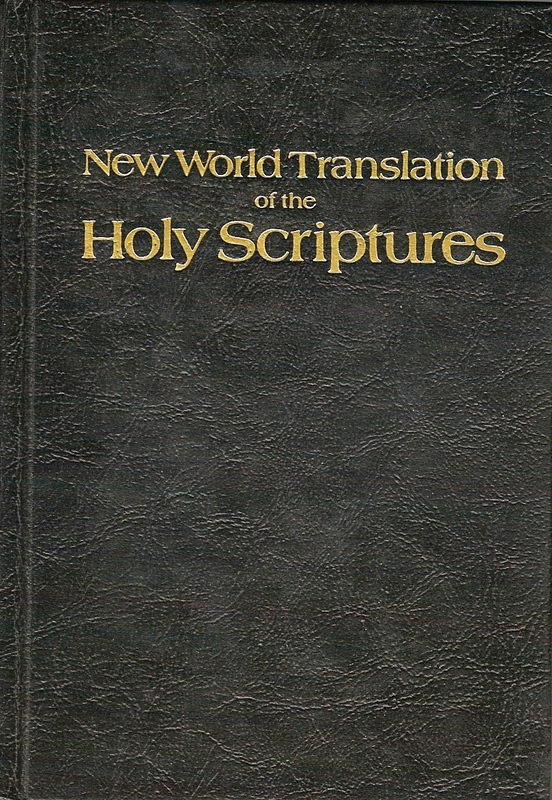 Comments: First edition: 280,000 copies. 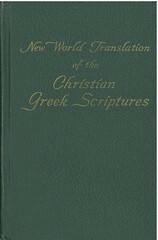 Greek Scriptures: Second Edition: 1,000,000 copies, Revised May 1951. 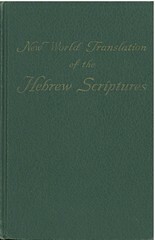 Contents: Hebrew Scriptures Vols. 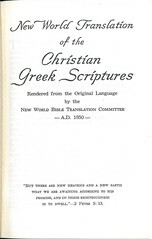 1 to 5; Christian Greek Scriptures. 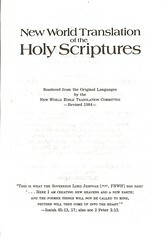 – Foreword (w/ photographs), Explanation of the symbols; Names and order of the books, Alphabetical index. 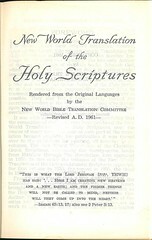 Apendix: Scripture verses specifically commented on; Subjects, Chain of outstanding Bible subjects and proper Bible names. 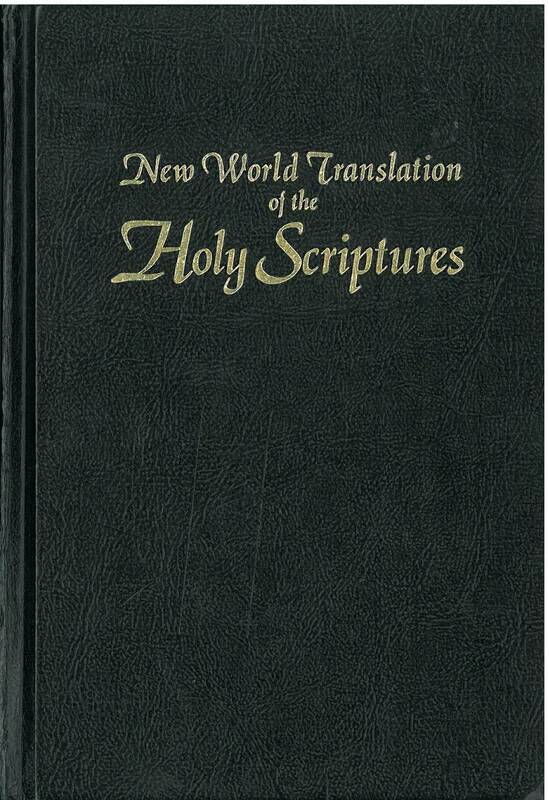 Watchtower Scripture Editions and Bible study aids; Bible Words indexed for quick information (Concordance). Coloured maps on both flyleaves. References: Taliaferro-EELBV see 7990.105, 7990.112, 7990.113, 7990.114, 7990.115, 7990.116. Comments: Hardcover small octavo, sewn binding, 3646 & (2) pp. 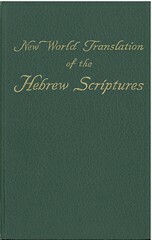 Scripture text in single column, cross references in the inner margins; alternate readings and manuscript information in footnotes. 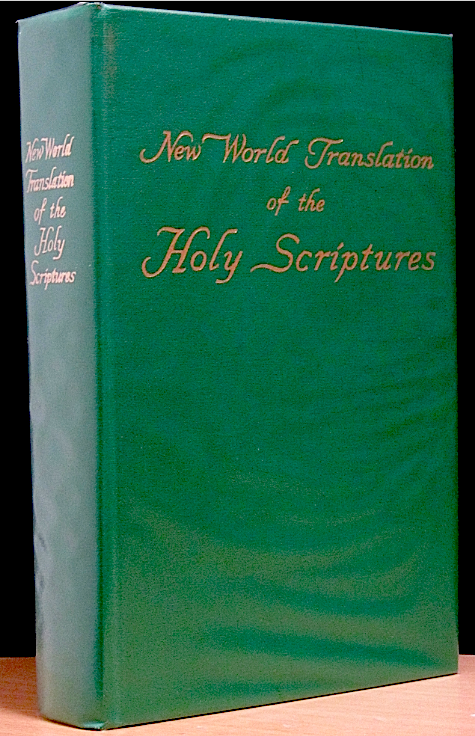 This bulky combined volume is colloquially called “Fat Boy“, later it was referred to as “Student´s edition“ in the Watchtower publications. The nearly 3500 pp have running pagination. 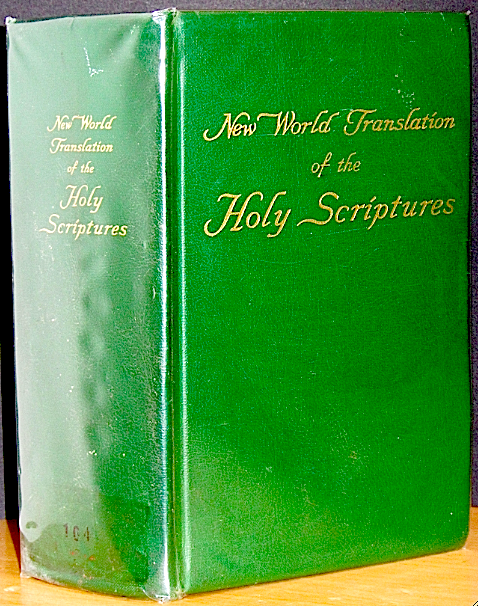 The maps of the 1st NT– edition have been replaced by coloured ones on front and rear flyleaves. References: Chamberlin 41-2, Taliaferro CN00025, Taliaferro-EELBV 7990.118. 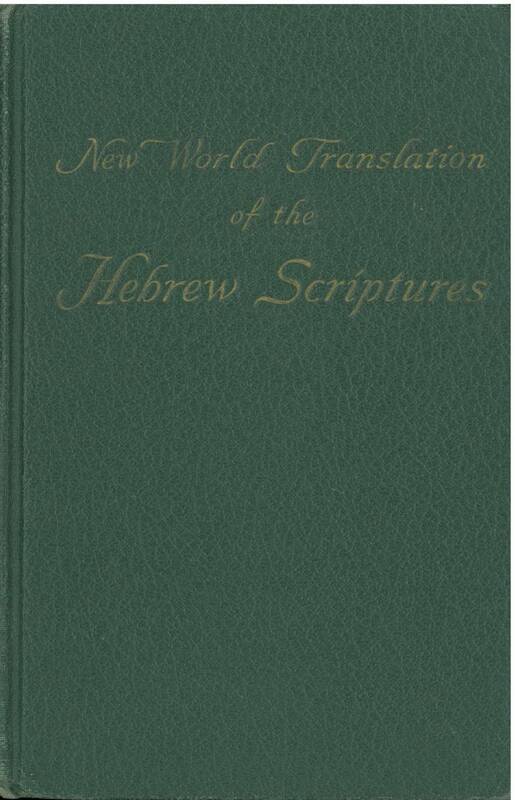 Contents: Hebrew Scriptures; Christian Greek Scriptures. 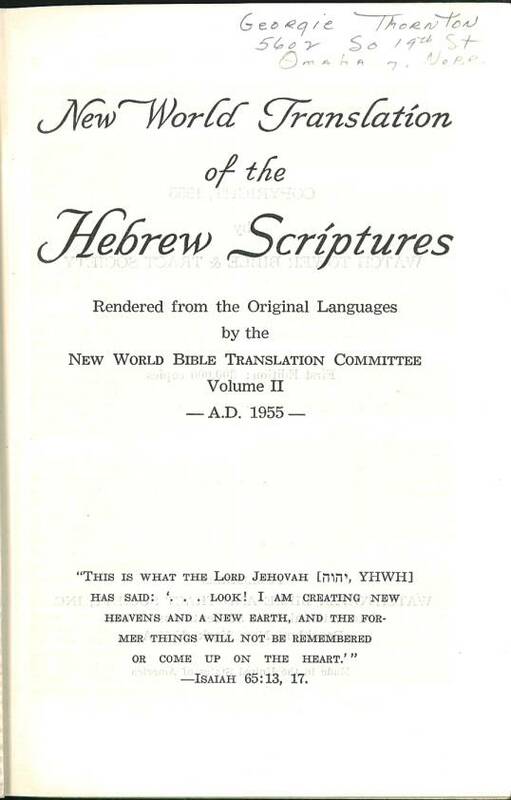 – The layout of Bible and the arrangement of biblical books are identical to the 1961 version. 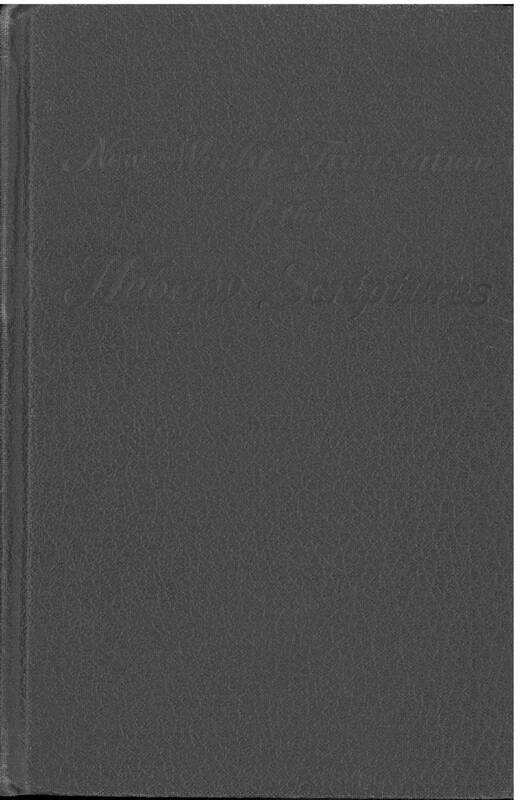 The Foreword, given New York, N. Y. January 17, 1961 is printed with following dates: First Revision 1961; Second Revision 1970. Coloured maps on both flyleaves. Comments: Hardcover small octavo, sewn binding, 3446 & (2) pp. 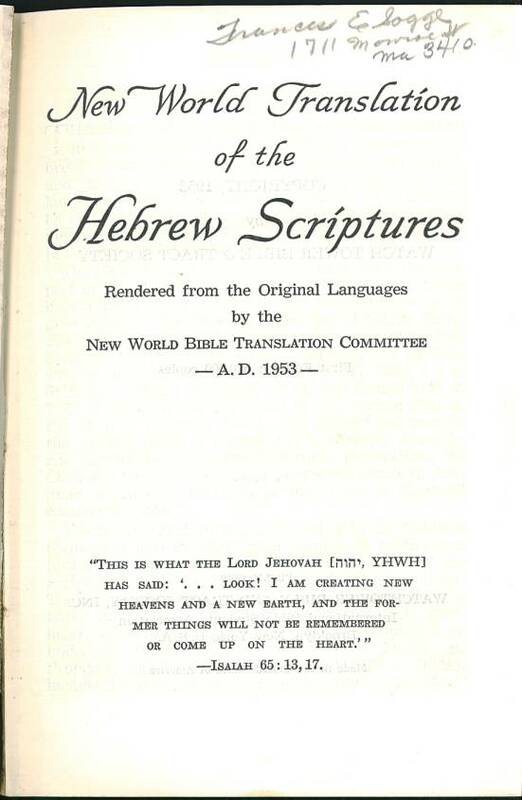 Scripture text in double column, no extras. 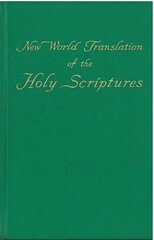 „Names and Order of the Books“, „Alphabetical Order, Abbreviation and Pages of the Books of the Holy Scriptures“ (2 pp) preceed the text. 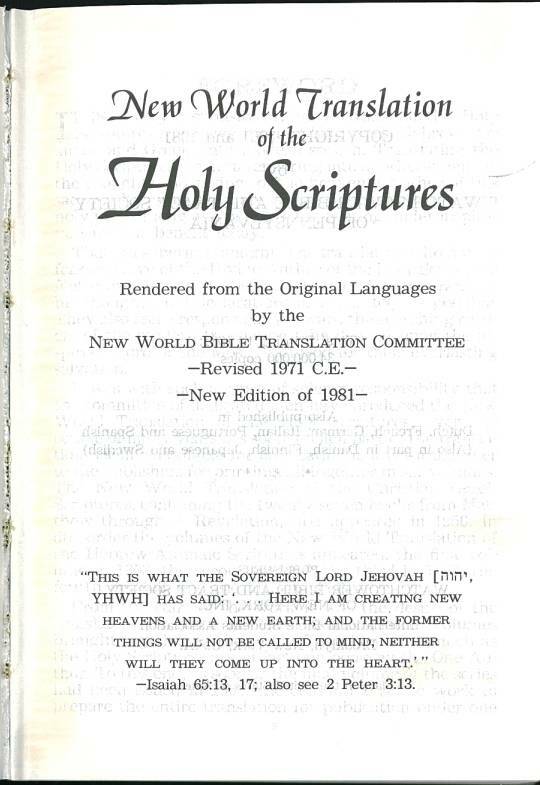 From p. 1341 103 pages “Important Bible Words for Quick Reference“ are listed as a concordance; from p. 1445 “A Listing of Outstanding Word Changes in the 1970 Revised Bible“ (2 pp.) 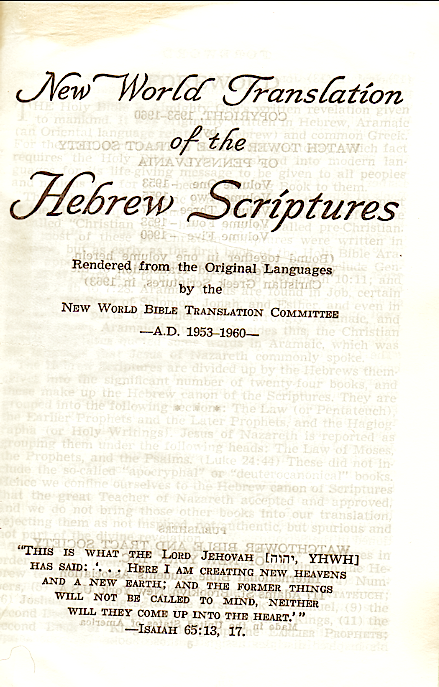 are found; The Appendixes contain „Scripture verses specifically commented on“, and “Subjects“ (13 pp). 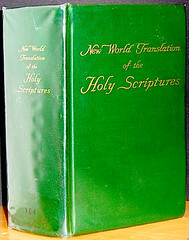 “Table of the Books of the Bible“ (2 pp) and charts & maps (6 pp) conclude this green standard NWT. References: Chamberlin 41-2, Taliaferro CN00025, Taliaferro-EELBV 7990.125. References: Chamberlin 41-2, Taliaferro CN00025, Taliaferro-EELBV 7990.127. 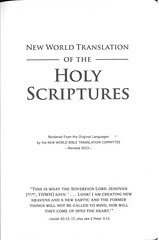 When the 2013 revision of the New World Translation was published there was a typographical error on page 267: the running header reads "Numbers 35:37-33:22" instead of the correct "Numbers 32:37-33:22" The first variant has a publication date of August 2013 while the corrected variant has a publication date of October 2013. 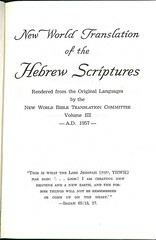 No textual variants have been discovered between the two editions. 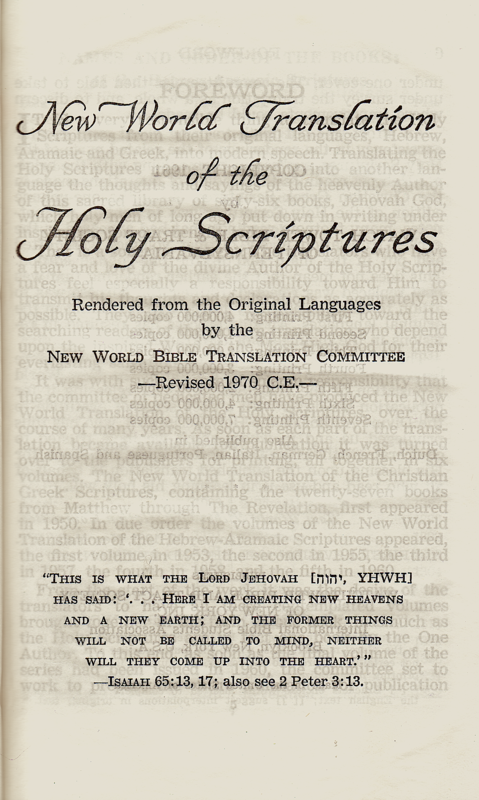 A textual variant has since been discovered in the May 2014 printing that has been included in all printings since. 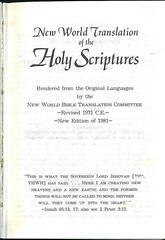 At Psalms 51:4 at the top of page 792 the latter half of the verse in the August 2013 printing reads: "So that you might prove righteous when you speak And be right in your judgment." Starting with the May 2014 printing it now reads: "Therefore, you are righteous when you speak, You are right in your judgment." 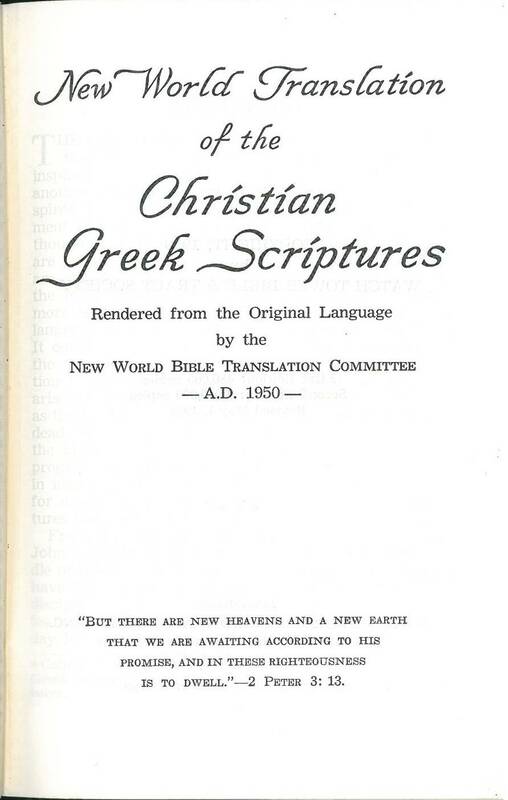 ➊ This advertisement taken from the first edition of the Greek Greek Scriptures (1950) lists those Bible editions printed by the WtB&TS; for the 1950 edition see first entry above; for the KJV (Watchtower print) there's no entry yet; for the ASV see American Standard Version.